The Interlogix Simon XTi-5 Version 2 is a cost-effective security system that offers up to 80 zones of burglary and fire protection, and which complies with SIA False Alarm Standards. The 80-632-3N-XTI5-2 wireless control panel features a 5-inch color LCD touchscreen with selectable user interface which provides at-a-glance system status, and easy to use icon-based system operation all at a cost conscious price point. The Simon XTi-5 Version 2 is ideally suited for monitoring the security and safety of houses, condominiums and apartments. The ability to add on Z-Wave® lights, thermostats, garage door and door locks, in addition to the Interlogix Image Sensor for viewing recorded snap shots and real-time look-ins, make it a perfect solution for whole home security and comfort management. All these functions can also be controlled remotely using Web portal and mobile applications powered by Alarm.com®. Any Webenabled device (laptop, smartphone or tablet) provides access to Simon XTi-5's functionality and even includes lifestyle-enhancing information such as the current outdoor temperature and a four-day weather forecast. 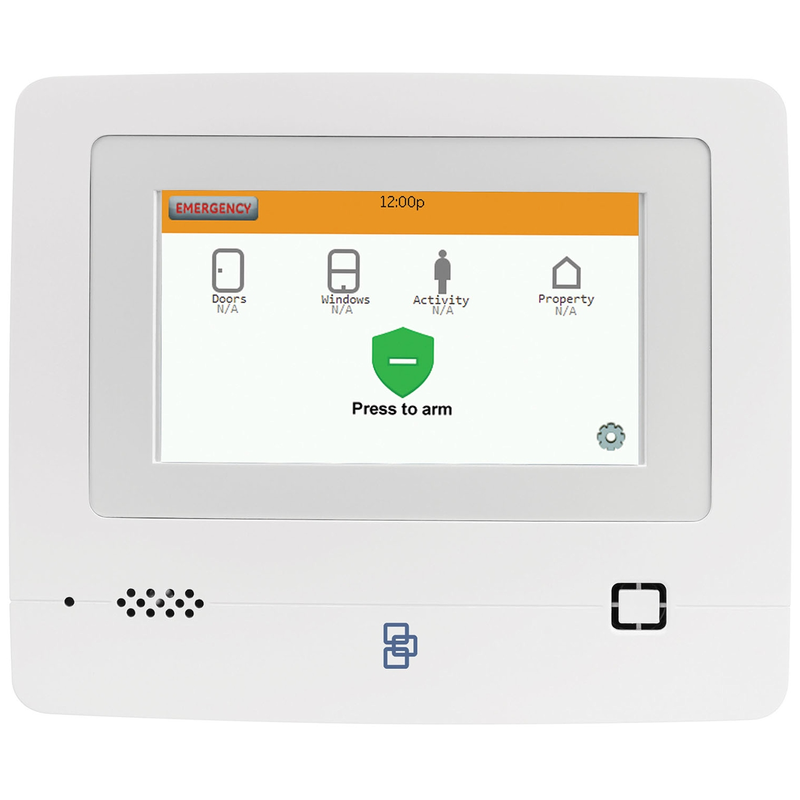 The Simon XTi-5 Version 2 panel comes standard with 80 wireless zones, or it can be set up with 78 wireless zones and two built-in hardwired supervised burglary zones (normally-closed loop only). The built-in radio receiver works with both crystal and SAW Learn Mode sensors in both encrypted, and un-encrypted formats. User friendly: simple, icon-driven, touch screen user interface - great for users of all ages! Easy to read: large 5" color LCD touch screen provides "At-a-Glance" status of home and property. Selectable user interface allows for customization to match mobile phone app experience. With the optional cellular LTE reporting and Alarm.com features, Simon XTi-5 Version 2 features remote monitoring and control of your security system for convenient and effective home protection. Quick, at-a-glance home status provides a complete view of home systems including security, indoor temperature and weather. Offers user-friendly system control and operation via the electronic keypad. Thermostat control makes it easy to set automation schedules in conjunction with lighting and security events to help save energy and reduce utility bills. Menu-based system programming and testing enables fast and accurate installation of the panel and supported devices.